… is, of course, Good. I’ve had to keep reminding myself of that lately. As I mentioned in last Thursday’s post, Neighborly Love, our property was brutally pillaged by thieves. They ripped through things that were sentimental and private. They stole items and assets that we had worked hard to be able to afford. Although we are still struggling with a smorgasbord of emotions (anger, being the most constant), we know that on the other side of Bad, is Good. We’ve experienced it firsthand: the kindness of complete strangers, our neighbors in the mountains who have banded together – as a matter of personal honor – to bring some order to all the mayhem and to secure the property once again. To be on the receiving end of such a magnitude of unconditional kindness … it’s beyond words. And now, we must move on from this and begin a new day. 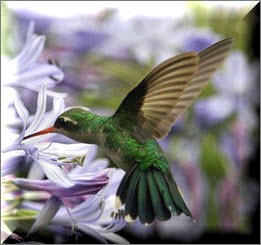 In the Andes of South America, the hummingbird is a symbol of resurrection. On cold nights, it appears to die but comes back to life at the first light of dawn. This entry was posted in heatherfromthegrove, inspiration, lessons learned, other musings, spirituality and tagged Heather Joan Marinos, Heather Marinos, heatherfromthegrove, Hope, hummingbird, kindness of strangers, Neighborly Love, Papyrus. Bookmark the permalink.